Won Ryu Hwan (Kim Soo Hyun), a military trained North Korean officer, is assigned on a mission to be a spy in South Korea. He is known as Bang Dong Gu, a goofy and mentally challenged young man, who lives in a poor neighbourhood where he stays at the old woman’s house. While monitoring his area, he gets closer with the neighbours and the old woman who treats him like her second son. One evening, he meets Lee Hae Rang (Park Ki Woong), who trained under the same North Korea unit which he went for. Hae Rang’s identity is a wannabe rockstar. Later, Ri Hae Jin (Lee Hyun Woo) comes from the North Korean unit and also act as the spy in the neighbourhood. While all three of them act as spies without being noticed by their neighbours, they wait for the orders from North Korea until, one day, they receive an unexpectable order. Secretly, Greatly has a standard but attention gripping storyline that majority of the mainstream audiences could enjoy. I give thumbs up to this storyline. 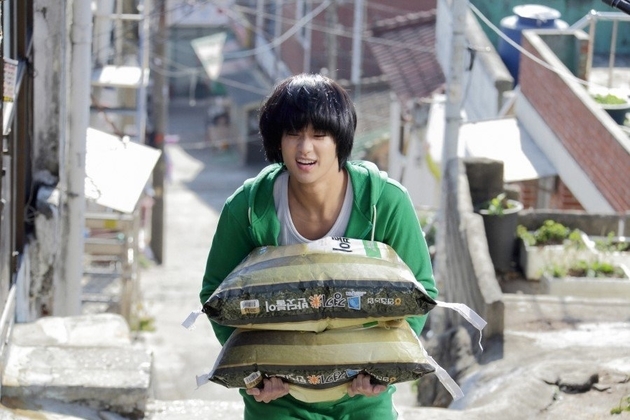 At the start, there are laughs from watching Ryu Hwan doing funny stunts to having conversations with the neighbours. In the second half of the film, the storyline starts to build up right when Ryu Hwan, Hae Rang, and Hae Jin meet together and later found that they have to commit suicide. Even though the storyline is fictional, sentimental emotions and laughter hit the spot especially when it comes to dialogue between characters. 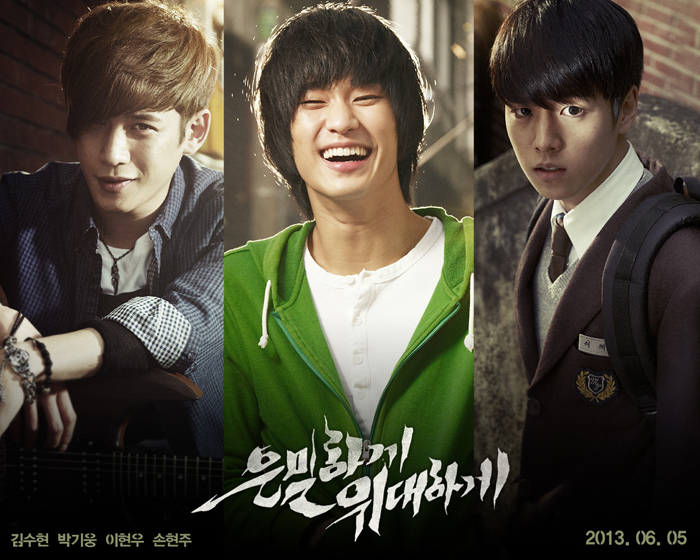 Kim Soo Hyun, Park Ki Woong, and Lee Hyun Woo, who are popular TV drama actors, show and develop their acting talents through Secretly, Greatly. Then again, most of the timing on screen all goes to Soo Hyun where I can see great potential from him in acting not only as the sweet and romantic guy next door in Dream High and Moon Embraces the Sun but also doing more physical fighting and stunts scenes. His acting skills through portraying Ryu Hwan, the serious fighting spy, and Bang Dong Gu, the funny and goofy kid, are truly remarkable when it comes it showing two different characters within the film. Furthermore, his monologues and conversations brought a lot of emotions that could bring the audiences’ attention to the growth of his acting career. With that, Ryu Hwan’s character developed throughout the whole film. However, there were not much character development for Hae Rang and Hae Jin. Not only because Ki Woong and Hyun Woo has limited time in appearing on screen in Secretly, Greatly, but also because Director Jang did not focus on their characters’ side stories. In their appearances in dramas, they have great potentials in acting. However, they should also be given the opportunity to shine and develop through Secretly, Greatly. Rather than focusing a lot on Soo Hyun, Director Kim and the production team should have placed both Ki Woong and Hyun Woo to be on the same boat as Soo Hyun. The script itself could have been better in having a focused balance on all three characters of the film. The cinematography was done well on the film sets whereby focusing and shifting on characters and location surroundings. I enjoyed the scenes which are shot in the neighbourhood because it brought me to the place with funny but warm-hearted community. Also, the action fighting scenes in the neighbourhood captivate my attention as the camera focuses on the character who is moving around the area including alleys and rooftops. Aside from the action scenes, Secretly, Greatly draws my attention to the sentimental value about the relationship between characters. All three guys have close friendship and brotherhood while being happy together with the neighbours who give them smiles and laughter. Also, the close bonding between the elderly woman and Ryu Hwan made me cried a bit on how she take Ryu Hwan as her second son. Although these scenes are quite common, the message is clearly identified by the audiences. Yet, there are some scenes which should have been much stronger as certain emotions from the characters are quite surface instead of moments that could make me cry even more with happy and sad tears. Secretly, Greatly is an enjoyable film to watch. You will laugh and then cry a little bit. It could have been even better if there is a balance on all three guys. Ki Woong and Hyun Woo should have been shown more often on screen so that they build up their acting capabilities. It would have been great to see Hae Rang and Hae Jin’s side stories. However, I am sure that they will have even more opportunities to be featured in films. Also, together with Soo Hyun, I see that they continuously growing to be great potential actors in both dramas and films. Compare to Bedeviled, Director Jang could have done more better, in terms of script and storyline. Although Director Jang’s camera brought the audiences with laughter, tears, and adventure, it still limits his skills as he tried to direct a different genre film especially when it is featured as a mainstream blockbuster film. I am sure Director Jang will be directing even greater films what we are all anticipating in the near future.